All the essential products you’ll need at your groundbreaking ceremony, this kit includes a carefully selected combination of tools and corresponding accessories and presents them as a single set. 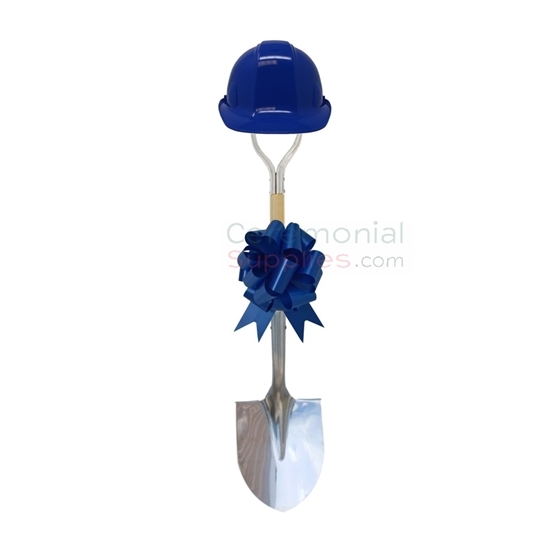 Your purchase comes with a deluxe groundbreaking shovel measuring an impressive 41.25 inches in height, a ceremonial hard hat and an 18 inch bow in a matching color of your choosing. The colors available are red, white, blue, orange and green. Need to personalize your kit? You can have your shovel and hard hats custom printed in full color or have a custom printed vinyl decal with your logo or commemorative text. Add Logo to Hard Hat? A groundbreaking ceremony is a big occasion, and the tools used to perform it should communicate said grandeur. A ceremonial hard hat and a groundbreaking shovel are items that are indispensable, but maintaining a healthy aesthetic appeal is always appreciated. A ceremonial bow helps a great deal in this matter. The Deluxe Ceremonial Shovel, Hard Hat and Bow Kit collects all three of these items, pairs them up as a single comprehensive set. With the attention to detail in the shovel, the festive nature of the bow, and the ability to choose your own color for the hard hat and the bow, you are provided the perfect opportunity to make your ceremony have some visual pizzazz. Go through the groundbreaking kits section of CeremonialSupplies.com to see more options of kits you could employ at your ceremony.